SCVHistory.com | Placerita Canyon | Dedication of Placerita Canyon State Park, 5-26-1956. Dedication of Placerita Canyon State Park. Event May 26, 1956 | News Reports. Placerita Canyon Park Dedicated by Carrillo. Program Commemorates California's First Wild Gold Rush More Than 114 Years Ago. Los Angeles Times | Sunday, May 27, 1956. Yellow flakes of gold, clinging to the roots of wild onions in Placerita Canyon near Newhall, started the first of California's wild rushes for the mineral more than 114 years ago. Yesterday, near the spot where Don Francisco Lopez, major-domo of the San Fernando Mission, first discovered gold, descendants of early California families, government officials and residents of the Newhall-Saugus area dedicated a shaded 48-acre site as Placerita Canyon State and County Park. They commemorated the canyon and its little streams which drew hundreds of hardy miners and prospectors after March 9, 1842, when the cry "Gold!" spread throughout the Los Angeles area and as far south as Sonora, Mex. The canyon is located about 40 miles northwest of Los Angeles and four miles east of Newhall in the San Fernando Hills. Hereafter, it will be maintained by Los Angeles County in an agreement with the State Park Commission. The latter purchased the land for future public enjoyment as an idyllic picnic grounds. Officials in the dedication program were Sheriff Biscailuz, descendant of the mission overseer; Actor Leo Carrillo of pioneer California stock and a member of the State Park Commission; Supervisor Roger W. Jessup and Paul Palmer, chairman of the fiesta committee. The story of the finding of gold by Lopez was narrated by Gabriel E. Ruiz, telling of the "Oak of the Golden Dream." As Ruiz read the story, it was enacted on a stage. Ruiz related how the mission official and an Indian servant named Julio were riding in the hills seeking stray cattle. They paused for a siesta under a huge, gnarled oak and soon Lopez had a dream, a dream that he had found gold. And, as the tale goes, moments later when he pulled up some wild onions, the glint of gold flecks caught his eye. Sheriff Biscailuz delivered an ode to the historic tree and Carrillo formally conveyed the park to Jessup for future operation. Others who participated in the two-hour fiesta included Judge Walter H. Odemar, Sonora Consuelo de Bonzo and members of the Native Sons and Daughters of the Golden West. Members of the Historical Society of Southern California were guests. 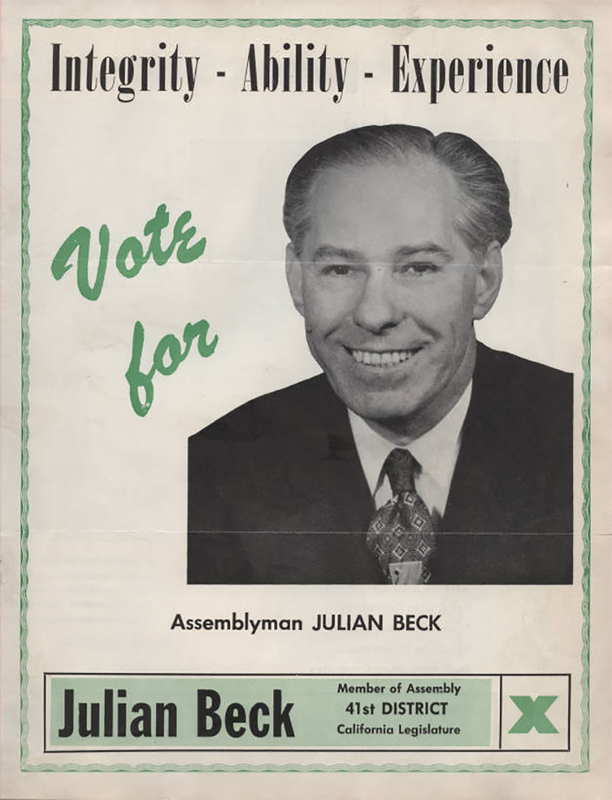 Judge Julian Beck was a member of the California Assembly from 1943-1953, representing San Fernando, Chatsworth, Granada Hills, Northridge, Newhall, Saugus, Lancaster and other parts of the Antelope Valley. He wrote the legislation that funded the initial purchase of land for Placerita Canyon State Park from Frank Walker (the state added to it in 1959), and he was instrumental in identifying a West Valley site for a college that eventually became Cal State Northridge. Gov. Earl Warren appointed him in 1953 to the L.A. Municipal Court bench, and Gov. Edmund G. Brown Sr. appointed him in 1959 to a Superior Court judgeship in San Fernando, where he served until his retirement in 1975. Click to enlarge. In the audience, there were numerous descendants of early California families named Lugo, Rivera, Yorba, Avila, Duarte, Garcia, Cota, Alvarado, Ruiz, Sepulveda and Palomares. Ninety Latin-American child dancers from East Los Angeles parks operated by the County Department of Parks and Recreation presented a dance recital. Municipal Judge Julian Beck introduced the bill, when he was a State Assemblyman, which provided money for purchase of the site. Jessup was instrumental in completing arrangements for its operation and maintenance by Los Angeles County. Golden Stream — At dedication of Placerita Canyon Park Prospector Fred Yoacum of Big Bear pans for gold in a stream as Actor Leo Carrillo, left, standing; Sheriff Biscailuz, center, standing, and youngsters watch. Front, hand in water, is John Landis, 8; behind him, Chuck Brown, 9; far right, Pat Taylor, 12.